Poul Anderson had a very long career writing both fantasy and SF for several decades before his death in 2001. Last year, I reviewed Anderson's 1954 fantasy novel, The Broken Sword, and found it to be a better adaptation of the Norse sagas than the other 1954 epic fantasy classic, Tolkien's The Lord of the Rings. Yet despite the critical acclaim Anderson received for The Broken Sword, it never got the level of popular support that it probably deserved. 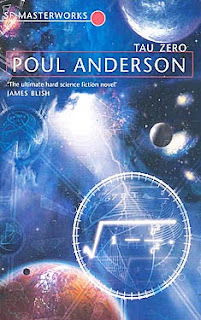 Anderson's biggest-selling novel, the 1970 SF novel Tau Zero, differs significantly from The Broken Sword, not just in content, but also in prose style and characterization. Despite realizing that it is very difficult to compare novels, even if they are by the same author, that are wildly divergent in form and focus, I found Tau Zero to be a less enjoyable read than Anderson's other works that I've read to date. The premise behind Tau Zero is that in the 23rd century, humans have perfected a propulsion system called the Bussard unit after a hypothetical molecule-harvesting propulsion system that would allow for ships to be propelled at speeds just under the speed of light. Following the equation , where "tau" is the relationship between actual speed and the theoretical limits of light speed (the closer the resulting fraction gets to zero, the faster the speed that the ship is traveling, with the attendant time dilation aboard due to relativistic time/speed relationships), the ship Leonora Christine is designed, with scheduled acceleration and deceleration intervals, to carry its crew of 50 individuals to a neighboring star in roughly five years of ship time (or a shade over 30 Earth years), with a new colony to be started there. Sound complicated? It is to some extent, but Anderson plays around with this concept in what was then a relatively novel format. He focuses much more on the individuals aboard the ship rather than on the science of the travels. If anything, the science within this book becomes so stretched in places that some may be pardoned if they wonder how a deus ex machina plot situation was executed without an actual or even metaphorical divine plot intervention. Anderson's story is told a bit haphazardly. He opens the story with what I presume is a satirical commentary on NATO-Warsaw Pact tensions of the 1960s by noting that there had been a nuclear war that had seriously hurt human societies and that in the aftermath of the conflict, all of the nations agreed to turn over all of their nuclear weapons to Sweden, with the notion that the Swedes were too pacifistic and weak to do more than act as a mild-manner policeman. Outside of using this to introduce one Swedish crewmember, Ingrid Lindgren (one might wonder what kept Anderson from having her first name be Astrid), this subplot is dropped rather quickly (and thankfully). If this were the only hokey scene in the novel, I would just write it off as being unrepresentative, but this sort of clunky use of metaphors crops up several times in the novel, lessening the impact of some of the scenes. I just had a very difficult time taking this novel seriously, as Anderson just seems to switch between playing up a situation for melodramatic effect and setting up a deeper discussion on matters of the universe, its origins, and human places within it. As the ship sails on, faster and faster as its "tau" approaches zero/light speed, billions of years pass by in an instant, making it almost impossible for there to be any real scope to be realized; just a whole bunch of zeroes tacked on, more or less. This lack of scope affects the gravitas of the scenes late in the novel. Where perhaps Anderson intended to show the destructiveness of time, the results come across more as a campy Star Trek-like approach to seeing the end of time/space in a "Big Crunch" situation. While I suppose Tau Zero could be labeled as a "fun" sort of "hard SF" novel to read, I am uncertain if I would consider it to be a "Masterwork." Anderson's prose is uneven and he seems undecided as to which tone is best for this novel. The characters and their individual situations were adequate for the first half or so of the novel, but as the story progressed, every felt more flat and distorted, perhaps the storyline equivalent to the time dilation that was occurring inside the ship. This unevenness in story presentation and prose dampened my enjoyment significantly. While I would not call this novel a "poor" novel, "uneven" seems to be the most apt descriptor for it. Certainly not one of Anderson's best efforts, based on the other two novels of his that I've read.